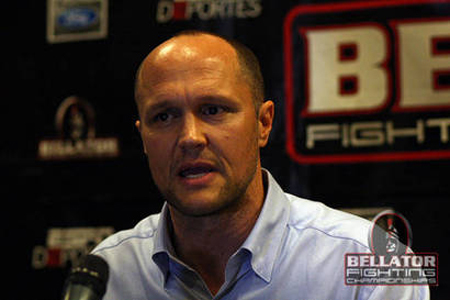 Fresh off Saturday’s surprisingly entertaining pay-per-view debut, Bellator MMA CEO Bjorn Rebney (pictured) isn’t afraid to admit that not all of his events are PPV worthy. Rebney is either a man who has looked in the mirror and is willing to admit that his roster isn’t star-studded enough to warrant their fans paying to watch most of their shows, or he’s taking a dig at the UFC for watering down their product with meaningless PPVs. “I just think that you’ve got to load ’em up,” Rebney said of his mindset when it comes PPVs. “You’ve got to have cards like the card we had [Saturday] to make it make sense. After the injury bug took a massive bite out of last night’s lineup when lightweight champ Eddie Alvarez was forced to withdraw from the featured attraction with Michael Chandler due to a concussion, many thought Bellator would change the event to a Spike TV broadcast instead of a PPV, like they were forced to do in October when Tito Ortiz withdrew from Bellator’s first attempt at PPV after breaking his neck. Instead, Rebney stuck to his guns because he believed there was still enough overall depth on the roster to justify the $30-$45 (depending on your cable provider) price tag. “So, my feeling is you should do pay-per-views when you can do huge depth on the pre-show on Spike and huge depth on the pay-per-view, and we did that [Saturday],” Rebney boasted. “And when we have the opportunity to do it again, whether it’s sometime later this fall or next year – whenever it is – we’ll do it again.